Lignin Market size was over USD 625 million in 2016 and industry volume is expected to surpass over 1.5 million tons by 2024. Increasing product usage in adhesives, binders and concrete admixtures is expected to drive lignin market size. Increasing demand for dust control systems driven by the rise in air pollution may accelerate industry growth. It is used as an additive in concrete due to water reduction property is likely to drive product demand. Lignin is used as concrete admixtures and can yield high performance concrete strength & grinding and minimizes the damage to external wall due to bad climatic conditions and acid rain. Asia Pacific infrastructure accounted for over 40% in 2016 and is expected to rise to over 45% by 2024. Increasing investments from private and government sector to develop public infrastructure such as roads, railways and transportation modes is likely to boost construction spending thereby promoting product demand. Dust from road construction and dust particles kicked up by moving vehicles make up to 33% of air pollution. Road dust may be suppressed using water sprayers, lignin products or sweeping vehicles, thereby driving the industry growth. Stringent government regulations and policies towards the usage of eco-friendly and bio-based products would promulgate the product demand. Rising environmental concerns regarding the use of synthetic products including low degradability, low toxicity is expected to be key factors to drive lignin market demand. Key raw material, wood is used for lignin production. The production of timber has witnessed a significant increase over past few years leading to a plenty in raw materials. However, the market growth is challenged by regulations like Lacey Act 2008, which restricted against the import and sale of wood products. Moreover, the industry growth is likely to be vulnerable by increasing awareness regarding the negative impact of the production of lignin on environment. Low purity lignin market size is poised to exceed USD 800 million by 2024. It has superior characteristics including low molecular weight, sulfur free and has a narrow molecular weight distribution, which will propel the industry growth. It is cost efficient and used in bio refinery, thus driving industry growth. Ligno-sulfonates market size may register a significant gain at over 4.5% during forecast timeframe. They are used to disperse pesticides, carbon black, dyes and other insoluble solids and liquids into water. They are also used to suppress dust on unpaved roads and are highly applicable in paper & pulp industry. Growing paper & pulp industry demand will fuel lignin market size. Kraft lignin market size is projected to reach at over USD 15 million by 2024. They are widely used in manufacturing insecticides and dyes. It is used in foam fire extinguisher to stable the foam. It is used as an intermediate in production of various compounds which includes activated carbon, cement additives, BTX, and vanillin, phenolic resins biofuels, carbon fibers, thereby propelling industry growth. 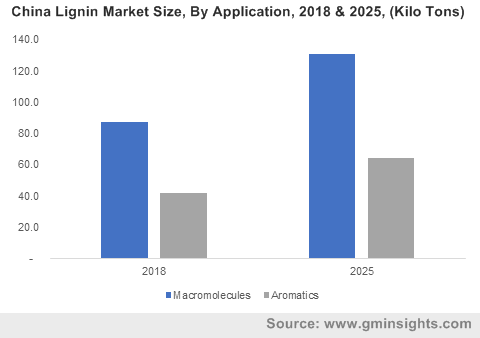 Lignin market demand from macromolecules applications is expected to register over USD 455 million by 2024. They are used in manufacturing of carbon fiber which are widely used in automotive and construction industries owing to their light weight. It is used in manufacturing various body parts of aircraft which consist of 50% of composites, thereby stimulating product demand. 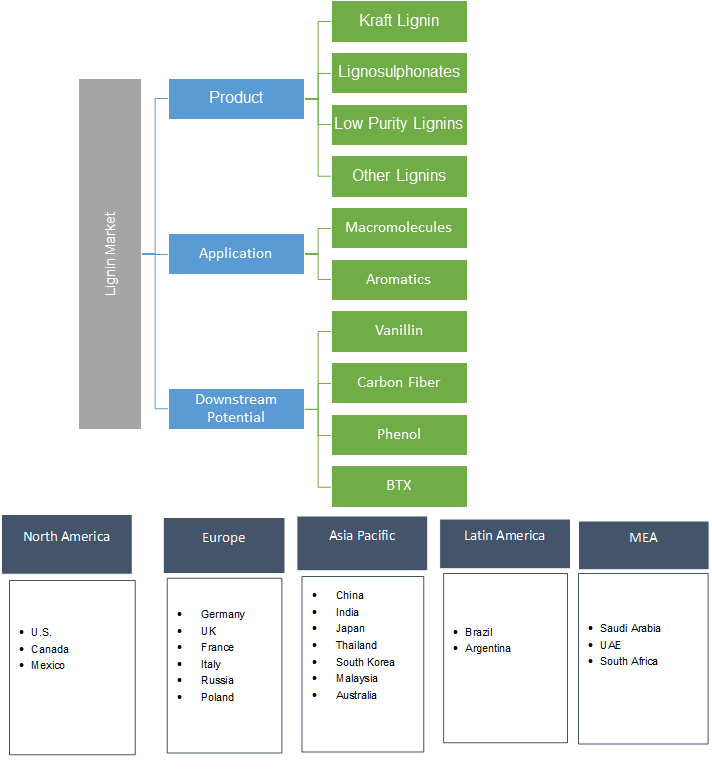 Lignin market from aromatics applications may grow significantly at over 5% during the foreseeable period. It can used as a substitution of phenol in chemical industry as it is available with efficient cost. It is widely used in adhesives, surfactants, epoxy resins and phenolic resins industries. The product is used to manufacture phenol derivatives which is used in cosmetics industries for production of skin lightening, hair colouring and sun screen products. Phenol finds major applications in pharmaceutical industry for manufacturing drugs. It is also used in manufacturing oral anesthetic products such as Chloraseptic to treat pharyngitis. Some phenolic compounds are believed to be cancer chemo preventives, compounds that may decrease your risk of developing cancer. Carbon fiber is used in applications where high mechanical performance and low weight are more important than low cost. Carbon fiber is currently used in applications with a demand for high mechanical performance, such as aircraft, sports equipment, satellite, formula 1 cars, pressure vessels, wind turbine components, thereby driving the industry growth. Vanillin is an organic compound which is manufactured by using lignin, and is used in cosmetics, pharmaceuticals, food & beverages and animal feed industries as a flavouring agent. It is used in the fragrance industry, cleaning products and livestock fodder. Hence, food & beverages industry potentiality accompanied by trend for renewable products demand are key reasons to fuel product demand, which will stimulate the industry growth. Europe driven by the UK, France, Russia, Poland, Italy and Germany market size is likely to expect to reach at over USD 350 million by 2024 owing to increasing dyeing industry. They are used as colorants in different industrial applications such as food processing, printing inks, wood stain and textile processing. High consumer awareness and demand for bio-based products in this region would propel the regional demand of the product. Strict regulation implemented by REACH regarding the restriction of transportation of synthetically driven chemicals may stimulate industry demand in the region. Rising demand for dust collectors in the region to reduce air pollution during construction projects may have a positive influence in the overall industry growth during the forecast timeframe. North America market demand, led by Canada, Mexico and the U.S. may witness a significant growth over 4% during forecast timeframe. Increasing inclination towards green building projects in the U.S. should drive industry growth in the region. Rapid urbanization along with increasing infrastructure investment should drive concrete admixtures demand in the region, which will parallelly stimulate the industry growth. Moreover, increasing building renovation and remodeling trends due to rising living standards may boost product demand in the region. Asia Pacific led by China, Japan, South Korea, Australia and India lignin market is expected to surpass USD 210 million by 2024. Increasing investments from private and government sector to develop public infrastructure such as roads, railways and transportation modes is likely to boost construction spending thereby promoting product demand. China is the major hub for chemical production and the country is expanding its base to influence product demand. Increasing pulp & paper manufacturing industry will accelerate lignin production demand in the region. Global lignin market share is competitive and moderately consolidated with major industry participants include Borregaard LignoTech, Burgo Group Spa, Domsjo Fabriker AB, Domtar Corporation, Ingevity, Liquid Lignin Company and Nippon Paper Industries which cater to domestic and international market. Manufacturing companies are focusing in expanding business across regions and developing strategies to size up production capability and strengthen global presence. Companies are also forming partnerships and acquire with local & regional companies to open new market opportunities, and further accelerate industry demand. Lignin is produced mainly as a by-product of the paper industry, separated from trees by a chemical pulping process. They are used dyes, carbon black, and other insoluble solids and liquids into water. Downstream applications of lignin are classified in Carbon fiber, vanillin, Phenol and BTX. Carbon fiber is currently used in applications with demand for high mechanical performance, such as aircraft, sports equipment, satellite, specialized tools, pressure vessels wind turbine. Rise in demand from applications such as phenol, animal feed, cleaning chemicals, dye dispersants, vanillin, and micronutrients are expected propel the growth.